Rattata Lightning in game: 5,596 Who? Important notice! Pokemon Rattata Lightning is a fictional character of humans. 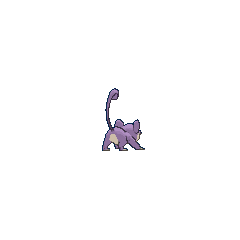 Rattata (Japanese: ???? Koratta) is a Normal-type Pokémon. It evolves into Raticate starting at level 20. In Alola, Rattata has a regional variant that is Dark/Normal. It evolves into Alolan Raticate when leveled up at night starting at level 20. It is the only possible starter Pokémon in Pokémon Rumble. Rattata is a small, quadruped rodent Pokémon. Its most notable feature is its large teeth. Like most rodents, its teeth grow continuously throughout its life and must be worn down by gnawing. The top half of its body is light purple, while the lower half is cream-colored. It has a pair of thin, cream-colored whiskers and a long tail that curls at the tip. Rattata has purple fur on its back, and cream fur on its stomach. Females have shorter whiskers and lighter fur color. Rattata can live wherever it can find food, which it searches for most of the day. Thanks to its sharp fangs, it is able to eat nearly anything. When it is threatened, Rattata can deliver a powerful bite. Its large teeth are also useful when using its former signature moves, Hyper Fang and Super Fang. Its hardiness lets it live in many environments, although it mainly lives on plains and savannas. Because it reproduces so quickly, a pair of Rattata can quickly colonize an area. The Rattata population in Alola was booming until Yungoos was imported as a control measure. In order to avoid these new predators, Rattata altered its habits. 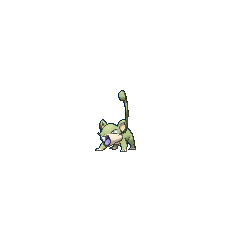 It moved to more urban areas, became nocturnal, and formed large nests led by Raticate. Alolan Rattata search out fresh food by smell, and ignore anything spoiled. It has dark gray fur and grayish-purple ear insides. There are two tufts of fur on each ear and near the tip of its tail. Its long, thin whiskers are replaced by shorter, thicker tufts of fur as well. The line where its cream underbelly meets its gray fur is ragged instead of smooth. Rattata debuted in the Pokémon - I Choose You!, trying to steal food from Ash's backpack. After Ash chased it off, it hissed at him before running away. A.J. has three Rattata, as shown in The Path to the Pokémon League. Casey also has a Rattata, whose only appearance was in The Double Trouble Header. It reappeared in a flashback in The Chikorita Rescue. Multiple Alola Rattata will debut in SM009. A Rattata belonging to an unknown Trainer was used by Ash in an attempt to stop Team Rocket in Pokémon Emergency!. Ash's Pidgeotto battled and defeated a Rattata owned by an unnamed Trainer in The Path to the Pokémon League. Two Rattata appeared in Bulbasaur and the Hidden Village. They were among the Pokémon in Melanie's care. They reappeared in a flashback in Bulbasaur... the Ambassador!. A Trainer's Rattata appeared in Electric Shock Showdown. A Rattata also appeared in Battle Aboard the St. Anne and Pokémon Fashion Flash. A Rattata was seen in a Pokémon Center in Sparks Fly for Magnemite. Rattata appeared in a fantasy in Dig Those Diglett!. A Rattata appeared in The Breeding Center Secret. Multiple Rattata were among the Pokémon seen at Professor Oak's Laboratory in Showdown at the Po-ké Corral. A pink Rattata appeared in Team Rocket's fantasy in In the Pink. Also, one was shown as part of an exhibition. Multiple Rattata also appeared in The Power of One. In The Poké Spokesman, Simon claimed to have met a Rattata, an Oddish and a Pidgey which could talk as seen in a flashback. A Rattata was one of the Pokémon living at Temacu's father's lab in The Heartbreak of Brock. Groups of several Rattata also appeared in Celebi: Voice of the Forest. A Rattata was one of the Pokémon seen at Wings Alexander's barn in Throwing in the Noctowl. A Rattata was seen in the wild in The Legend of Thunder!. In Talkin' 'Bout an Evolution, Team Rocket's experiments made Pokémon feel sick, one being a Rattata. Rattata were among the inhabitants of the Dragon Holy Land in Fangs for Nothin' and Great Bowls of Fire!. A Rattata was seen being fed by Tracey at Professor Oak's Laboratory in Johto Photo Finish. Three Rattata were among the Pokémon that were having trouble with the Haunter from the area they lived in. Pikachu and Meowth managed to drove the Haunter away. A Rattata was used by one of the students of the Pokémon Trainer's School in Gonna Rule The School!. Multiple Rattata appeared in the opening of Destiny Deoxys. Two Rattata appeared in a flashback in Pokémon Ranger and the Temple of the Sea. A Rattata appeared in The Saffron Con as a Pokémon owned by a Coordinator that was taken by Team Rocket. Two Rattata appeared in the Space-Time Tower in The Rise of Darkrai. A Coordinator's Rattata appeared in Team Shocker! participating in the Performance Stage of the Solaceon Contest. Many Rattata appeared in Pokémon Ranger and the Kidnapped Riolu! Part One. A Rattata appeared in Camping It Up!. Groups of several Rattata appeared in Leading a Stray! and Steeling Peace of Mind!. A Rattata also appeared in Historical Mystery Tour!. Several Rattata appeared in Arceus and the Jewel of Life, joining the Johto starter Pokémon in the fight against Marcus. A Rattata was used alongside a Lickilicky in a Double Performance during the Sinnoh Grand Festival in Last Call — First Round!. A Rattata appeared in the opening scenes of Zoroark: Master of Illusions. Multiple Rattata appeared in Piplup, Pansage, and a Meeting of the Times!. A Rattata appeared in The Island of Illusions!. A Rattata appeared as a mask for the festival in Capacia Island UFO!. A Rattata appeared in a flashback in Seeing the Forest for the Trees!. A Rattata appeared as a silhouette in SM003. EP001 Rattata Ash's Pokédex A Forest Pokémon, Rattata. It likes cheese, nuts, fruits, and berries. It also comes out into open fields to steal food from stupid travelers. Red caught a Rattata in File 1: Red. It was used to battle Brock but lost. A Rattata appeared in File 2: Cubone at the Pokémon House in Lavender Town. 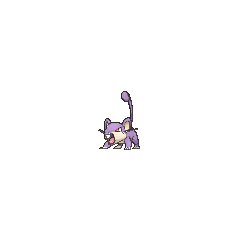 A Rattata appeared in File 3: Giovanni at Silph Co..
A Rattata appeared in Ecruteak City in The Reawakening. One of the events shown during the Nomads Independence Day festival in The Human Race and the Pokémon Race was the Fuchsia Rattata Race, a race between only Pokémon of the Rattata species. 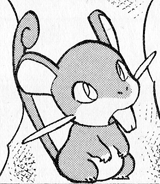 Rattata's first appearance is a cameo in the Red, Green & Blue chapter in Bulbasaur, Come Home! as one of the Pokémon that escapes from Professor Oak's Laboratory. One makes another appearance in ...But Fearow Itself! when Bill is transformed into one in an accident with his Pokémon transporter. A Rattata appeared reuniting with its trainer in Buzz Off, Electabuzz!. 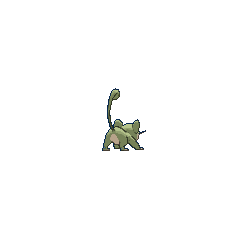 Another Rattata appeared as a silhouette when Green explains about Mew in The Jynx Jinx. Yellow owns a Rattata named Ratty which first appeared in Drat That Dratini!. After training with Blue, it evolved into a Raticate. A Rattata appeared in a flashback in Growing Out of Gengar where it was driven away from its home after the Power Plant had been abandoned. Another Rattata appeared in The Legend where one was seen by a lake when Green had finished her message to Silver in Johto. Youngster Joey has a Rattata as his only known Pokémon, which it first appeared in Murkrow Row. Cyrstal captured a Rattata on her way to Professor Elm's Laboratory in Three Cheers for Chikorita. In Off Course with Corsola, Bill fantasized about two Rattata, one from the Kanto region and the other from Johto, when he explains to Crystal that Pokémon from different regions can have different colors, patterns, and features. A Rattata appeared in Pocket Monsters HeartGold & SoulSilver Go! Go! Pokéathlon. Red caught a Rattata prior to Red VS Green?! where it participated in a soccer match against Green. Giovanni sent out two Rattata in Pokémon Hair Salon Opens!! to massage the customers in his hair salon. Bites anything when it attacks. Small and very quick, it is a common sight in many places. Will chew on anything with its fangs. If you see one, it is certain that 40 more live in the area. Scurries around quickly, searching for hard objects to gnaw. It appears to be jittery and unable to remain still. It eats everything. Wherever food is available, it will settle down and produce offspring continuously. Living wherever there is food available, it ceaselessly scavenges for edibles the entire day. This Pokémon's impressive vitality allows it to live anywhere. It also multiplies very quickly. Rattata is cautious in the extreme. Even while it is asleep, it constantly listens by moving its ears around. It is not picky about where it lives - it will make its nest anywhere. A Rattata is cautious in the extreme. Even while it is asleep, it constantly moves its ears and listens for danger. It will make its nest anywhere. Its fangs are long and very sharp. They grow continuously, so it gnaws on hard things to whittle them down. It searches for food all day. It gnaws on hard objects to wear down its fangs, which grow constantly during its lifetime. Rattata is cautious in the extreme. Even while it is asleep, it constantly listens by moving its ears around. It is not picky about where it lives—it will make its nest anywhere. Its incisors continue growing until its death. If its Trainer doesn’t offer it a file to gnaw on, it will gnaw on door frames, table legs, and so on. With their strong capacity for survival, they can live in dirty places without concern. Left unchecked, their numbers multiply rapidly. With its incisors, it gnaws through doors and infiltrates people’s homes. Then, with a twitch of its whiskers, it steals whatever food it finds. When the sun goes down, it becomes active. It runs around town on a chase for good food for the boss of its nest—Raticate. This Pokémon's Special base stat in Generation I was 25. Alolan Rattata has the same stats as a regular Rattata. If this Pokémon is given a Ring Target, the effectiveness of Ghost-type moves is ½×. Moves marked with a superscript game abbreviation can only be bred onto Rattata in that game. 51%-100% HP I'll gnaw the best I can! 26%-50% HP Um, my HP's already down to half. Level up I leveled up! I'm happy! If captured, Rattata throws tackles as hard as it can with its tiny body. It attacks by chomping with its powerful front teeth. 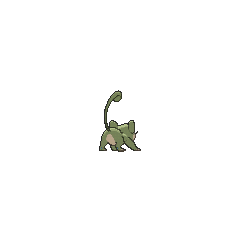 For other sprites and images, please see Rattata images on the Bulbagarden Archives. No other Pokémon has the same type combination as Alolan Rattata and its Alolan evolution. In the Pokémon Red and Blue beta, Rattata was originally known as Rattatak. Rattata is notorious for being associated with the F.E.A.R. strategy. Rattata and its evolution share their category name with Pikachu, Raichu, Sandshrew, and Sandslash. They are all known as the Mouse Pokémon. Rattata has gained notoriety among the fanbase due to Youngster Joey on Route 30, and his phone calls claiming his Rattata to be within the top percentage of the species. Rattata is based on a rat. The shape and position of its ears might be derived from the dumbo rat. Alolan Rattata may be based on how Hawaiian rats tend to be more vicious than most other areas of the world, which would explain its Dark typing. Their regular attacks on sugar cane fields forced the natives to import the mongoose, explaining the relationship between Yungoos and Rattata. 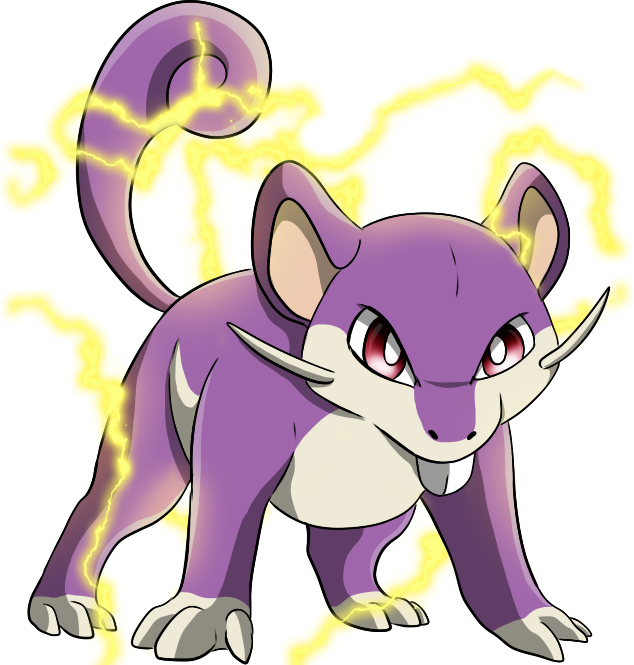 Rattata may be a combination of rat and attack, evident from its prototype name, Rattatak. It may also incorporate the onomatopoeic word rat-a-tat. Koratta is a combination of ? ko (child) and Ratta (Raticate's Japanese name), leaning toward the meaning "child Ratta." It may also be a combination of ? ko (small) and rat. Cantonese Chinese ??? Síugodaaht Partial transliteration of Rattata's Japanese name. Means "Little Raticate"
Mandarin Chinese ??? / ??? Xiaoladá Partial transliteration of Rattata's Japanese name. Means "Little Raticate"